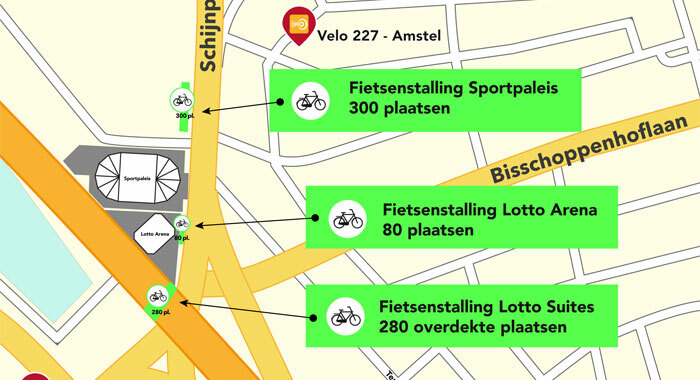 Going on foot is an excellent choice for those who are living or working in the close proximity of the Sportpaleis. No traffic delays and no parking problems. If you’d like to take a cab, please make sure to read the following, as it will ease and quicken your travel to/from the Sportpaleis. BEFORE an event, you can ask your driver to drop you off at the curb in front of the entrances. AFTER the event we advice you to walk to the taxi stand in the Van der Delfstraat, the small street just opposite the venue.